WOULD YOU BUY YOUR OWN COFFIN? The cost of a coffin is one of the most expensive items for any funeral, and many people either don’t have the means to pay for a coffin or would prefer not to spend such a large sum of money. The price of coffins can vary significantly, ranging from as low as $300 up to $10,000+ depending on the type of coffin you choose and the funeral director you use. Click here for more information on the difference between coffins and caskets. There is a wide range of coffins available on offer by funeral directors and suppliers. Coffins vary in materials and costs depending on your choice and budget. Click here for our guide on your funeral choices. Solid timber coffins are crafted entirely from solid wood, usually from the same species of tree and grown on plantations. They are often chosen for their quality, colour and beauty of the wood grain. This term refers to medium-density fibreboard (MDF) and particle board. The coffin is made from engineered wood products and are finished with a wood veneer, or painted in a special finish to enhance their appearance. They are less expensive than solid wood coffins. Metal casket options include solid steel, stainless steel, copper, and bronze. Bronze and copper are among the most durable of metals, which makes them ideal for the construction of metal caskets with protective qualities. These are usually more expensive than timber coffins, and cannot be used for a cremation. Cardboard coffins have become a popular option in recent years. They are an eco-friendly option and can be decorated in high quality designs which are limited to your imagination. They can also be personalised with photographs, wording or you can paint and decorate the coffin yourself. Wicker coffins are another eco-friendly alternative to the traditional wooden coffin. Wicker coffins are often chosen because they are extremely environmentally friendly, constructed using only natural materials. Can you BYO your own coffin? Yes, you certainly can. There is no regulation for a Funeral Director to deny you your right to source a coffin that is not of their own. 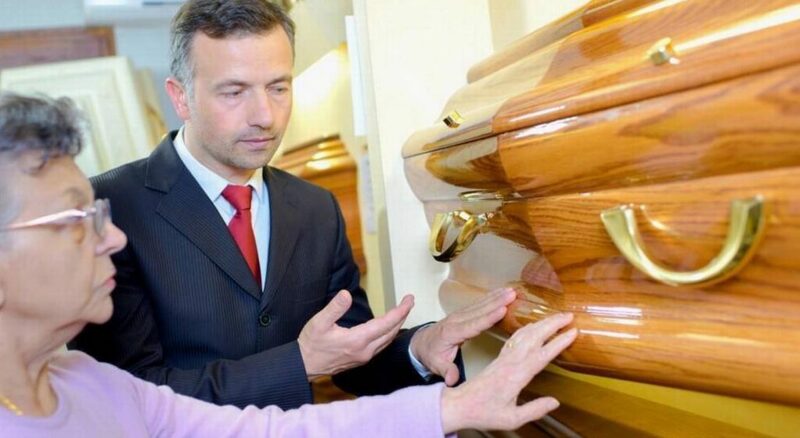 There are many independent funeral directors who would have no problem in letting you BYO coffin. Our Premium Member Funeral Directors are about looking after their client families and allowing them to have choices and the ability to honour and celebrate the life of the ones they love in their own unique way. The sale of coffins is big business and companies like Costco now offer an affordable range of coffins and caskets direct to the public. All their coffins are tested and certified by an independent Australian ISO/IEC17025 laboratory and comply with the guidelines set by the Australasian Cemeteries and Crematoria Association. A rental coffin is a good cost-saving option if you want to have a traditional coffin at a viewing or funeral, but don’t want to purchase an expensive coffin. A rental coffin is a coffin that has a removable interior. The body is placed in a simple wooden box and the box is placed inside the coffin, giving the appearance that the body is actually in the coffin. In fact, the body never touches the coffin, and the wooden box is easily removed after the service. The body can then be buried or cremated in the simple wooden box, and the funeral home can re-use the rental coffin. Rental coffins are available for rent at many funeral homes. If you are interested in using a rental coffin, make sure that the funeral home you are working with has rental coffins available. Click here for our guide on understanding funeral costs. What else should you know about coffins? Burials or cremations are not permitted without a sealed coffin (except where some religious institutions have obtained exemptions). A family carpenter can make the coffin — but it will have to comply with government regulations, the funeral director’s handling and strength requirements and any crematory requirements such as coffin dimensions. Metal liners, metal inserts, PVC or latex-based rubber materials are not permitted in or on coffins used for cremation because unacceptable emissions or residues can result. With burials, some people like to place religious or sentimental items inside the coffin or on its lid. In most cases this will not be a problem. However, problems can arise with items placed on top of the gravesite itself. For aesthetic or safety reasons the cemetery may not allow this. It is always wise to get advice from the funeral director or cemetery beforehand. There are also a number of items that cannot be placed inside coffins during cremation as these can cause explosions. eziFunerals recommends that you contact one of the local coffin suppliers or alternatively an Independent Funeral Director found at eziFunerals before selecting and purchasing a coffin. Don’t be rushed into selecting and coffin. Take your time and ask lots of questions. Choose a coffin within your price and budget. Ask the funeral director to see the entire range of coffins on offer. Don’t feel shamed if you choose a coffin at the lower price range. You’re with friends. Don’t be afraid to ask for a rental coffin. Who Will You Get To Carry The Coffin? Need a Quick Funeral Quote? If you need a Quick Quote, you can connect with Independent Funeral Directors by simply filling our quick and easy quote form. I have a huge question. Can I buy a wicker willow coffin? I am not dead yet but plan to have a coffin ready in case. Seems, everyone wants to make money. They are in the city and I’m in the bush. Need price, cost of freight and a hope all goes well. Can you assist? It depends where you are you located?